Be the first to share your favorite memory, photo or story of Gladys. This memorial page is dedicated for family, friends and future generations to celebrate the life of their loved one. Gladys E. Lacefield was born March 24, 1923 to Clifford and Alice Katy Albertson on Ennis Street in Houston, Texas. Gladys had a happy childhood growing up. She graduated from Milby High School in 1941 and soon went to work for Southwestern Bell Telephone Company as an overseas and long distance operator. Gladys met Vernon C. Lacefield from Lampasas, Texas. They dated for four years and married New Years Day, 1943. Vernon’s mother lived with them for thirty years. She was a Christian lady who was pleasant and good to all who knew her. Gladys and Vernon could not have children of their own so they adopted a baby boy and named him Carey. Ten years later, they adopted a baby girl and named her Lynda Kay. Carey went into the Naval Reserves, but death took him at an early age. Gladys and Vernon knew about another child who needed a home so they adopted a second girl at five years of age whose name was Wanda Darlene. Gladys was an excellent seamstress and sewed many items of clothing for her children. She also sold Avon for twenty years while living in Pasadena and was very successful. Upon returning to Madisonville, Gladys volunteered her time at the Sunshine Center for ten years and was a member of the North Madison Church of Christ. Gladys and Vernon had a good life and shared a lot of happiness. Sadly, Vernon passed away on labor day in 2002. However, it was a glorious day on March 22, 2019 when Gladys made her way to heaven and was reunited with Vernon, Carey and her Lord and Savior, Jesus! Gladys was preceded in death by both of her parents; husband, Vernon Lacefield; son, Carey Lacefield and sister, Tiny Hurtt. She is survived by daughters, Lynda Kay Serinald of Palmer and Darlene Lacefield of Madisonville, as well as grandchildren, Lacey Goodman and Drew Taylor. 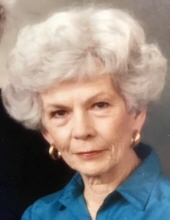 Funeral services for Gladys will be held 10 A.M., Tuesday, March 26, 2019 at Madisonville Funeral Home in Madisonville, Texas. Dale Underwood will officiate the service. A graveside service will be held the following day at 1 P.M. at Forest Park Lawndale in Houston, Texas. The Lacefield family will receive friends Monday, March 25th from 6 P.M. to 7:30 P.M. at the funeral home. To send flowers or a remembrance gift to the family of Gladys E. Lacefield, please visit our Tribute Store. "Email Address" would like to share the life celebration of Gladys E. Lacefield. Click on the "link" to go to share a favorite memory or leave a condolence message for the family.